you probably have your christmas/holiday whatnots all put together, baked and packaged. but if you don’t and you just need one quick (but impressive) treat to throw together, consider the meringue cookie. in case you read the word “meringue” and immediately tuned me out in fear of beating egg whites and sugar syrups and gasp using a candy thermometer! trust me. nothing could be more simple. plus, you most likely have everything you need on hand anyway! 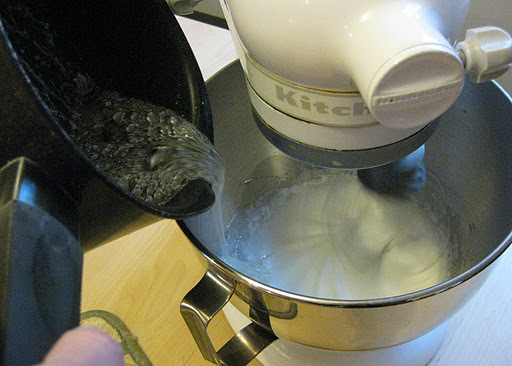 add the egg whites to the bowl of your stand mixer. 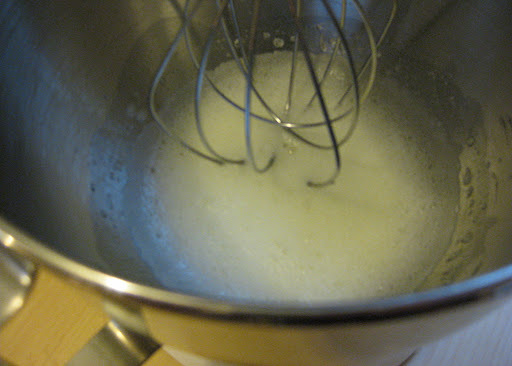 beat the egg whites on medium until they begin to appear frothy, add the salt and cream of tartar. continue to beat until the egg whites form soft peaks. 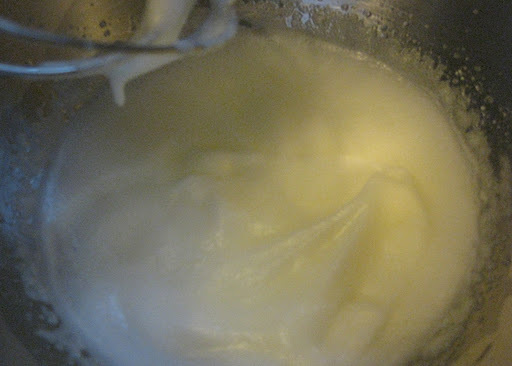 once you have soft peaks, turn off the mixer. meanwhile… add the granulated sugar, corn syrup and 1/4 c water to a small saucepan. stir to combine. 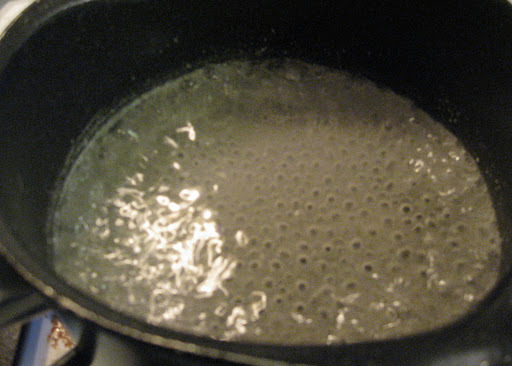 put a lid on the saucepan and set it over medium-high heat until it begins to bubble. remove the lid and turn the heat down to medium to medium-high. 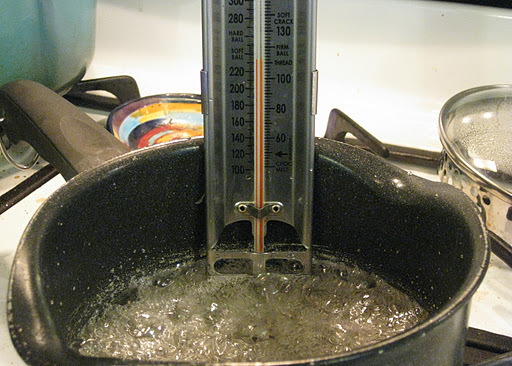 clip on your candy thermometer and let the syrup cook until it reaches 236 F (soft ball stage). remove the pan from the heat, turn on your mixer to medium and carefully add your syrup to the beaten egg whites. be careful not to pour directly on to your mixer beater or you could find yourself in the very uncomfortable position of having melted sugar all over you. that would be bad. once all the syrup has been added turn up the mixer to medium-high and beat for about 5 minutes or until the egg whites are thick and shiny and have cooled to room temperature. add the vanilla and peppermint extract. 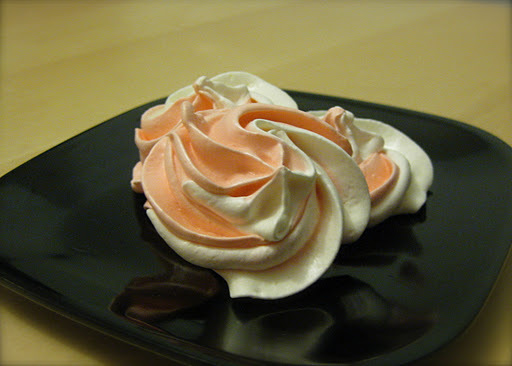 if you wish to color your meringue, now would be a good time to do that. 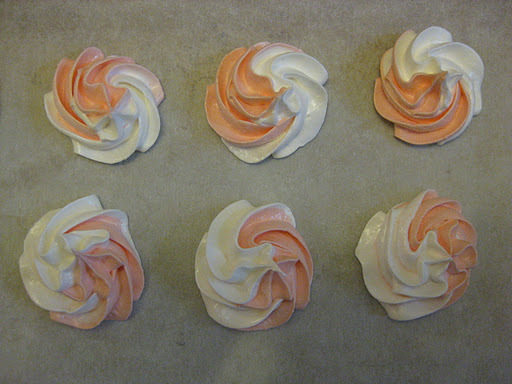 to get the swirl, scoop half of the meringue into a piping bag. 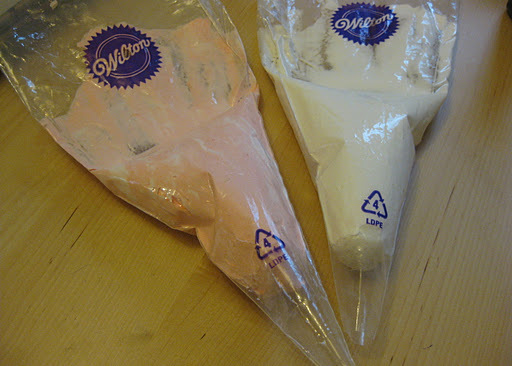 color the other half then scoop it into a second piping bag. 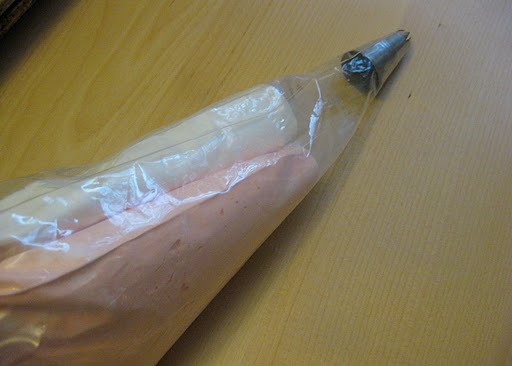 then, place both bags inside a third bag fitted with a big star tip. squeeze it all together for perfect swirls! 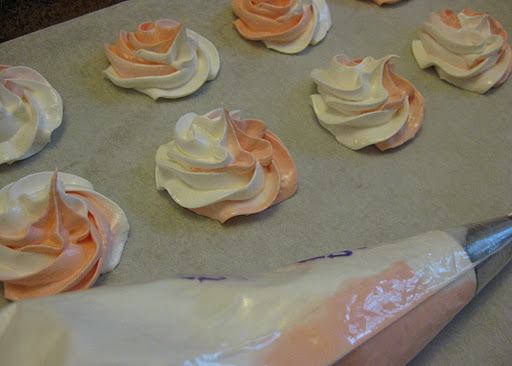 heat the oven to a low 200 F. on parchment lined baking sheets, scoop or pipe your meringue into little shapes. bite sized is best, i got carried away and made these too big! once you have them shaped, put them in the oven for 1-2 hours (depending on their size). shut off the oven and crack the door open to let them continue to dry and harden, about 30 minutes to an hour. these are melt in your mouth delicious and basically not bad for you! it’s definitely a treat you don’t have to feel bad about eating or giving away. first: i was in a hurry. second: i was in a hurry. third: i was in a hurry! that and i was kinda fumbling my way through it, learning as i went. i basically just approached this like any other dress i’ve made and constructed it in much the same way. i did a self-lined tank bodice, pleated and attached the lined skirt pieces, hand stitched the bodice lining to the zipper and waist to hide all my seams and did a machined blind-hem. i know my interior work isn’t perfect and i guess that’s where i fumbled a bit. on a regular woven all this would have been just fine. on stretch knit… i’m thinking there must be a better way. the lining to my skirt (which i should have left off, really) wasn’t as stretchy as i had anticipated, but i just have it in my head that i must line everything i make and so i just couldn’t leave it out. then, i wasn’t sure of the best way to sew down the bodice lining. hand stitching along the zip? fine. 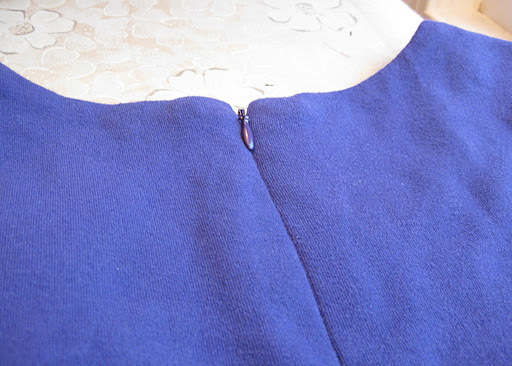 hand stitching the bodice lining at the bodice/skirt seam? hmmm… it seemed to work out fine. 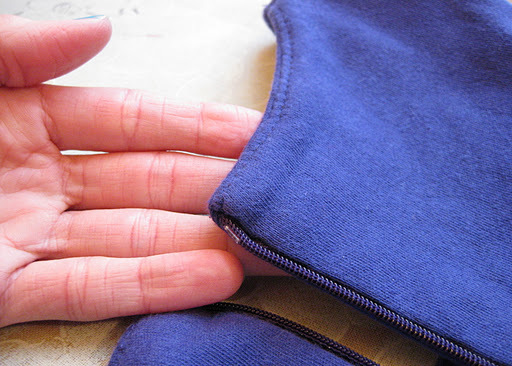 i don’t know how to securely hand stitch a seam that is intended to have stretch. initially my plan was to underline the bodice and use facings around the neckline and armholes to preserve a structured edge. doing so would have given me a nice neat finish at the top of the dress around the zip. but with the standard “sew around the neckline, armholes then turn right side out” method i was left with no choice. then again, i really like the self-lined bodice. so, maybe i did it right after all? do you even know what i’m talking about? am i just a wack-a-doodle that worries about such details? you don’t want to be inside my head. look! my zip lines up perfectly! 1. not line the skirt!! duh. 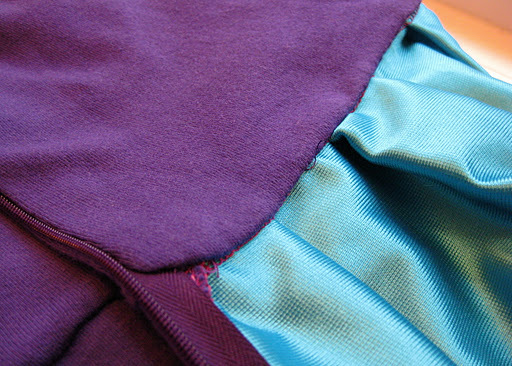 the extra weight of the lining ends up stretching and pulling the bodice down, even though it’s two-way stretch material. my original thought was that a slippery lining would make it nicer for wearing with tights. i’m not a fan of the “skirt riding up and sticking to your tights” look, but it probably wouldn’t have been an issue. 2. the armholes are a smidge tight. 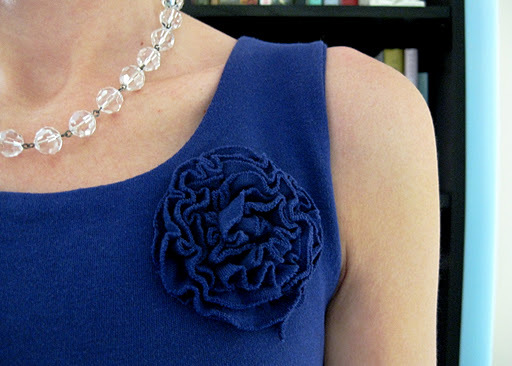 i often have the problem of the armholes being too big and perhaps i erred too far the other direction. not enough to be a problem or make it uncomfortable, just an adjustment i’ll make for future dresses. 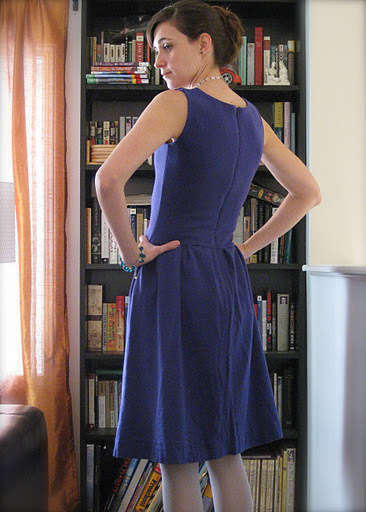 3. figure out how to handle lining a structured knit dress. i know, the beauty of a knit dress is that it doesn’t need structure. yet i really like the structured look without feeling constrained or worrying terribly about bodice fitting issues in a woven. my afore mentioned non-bustiness creates many fitting issues for me, something using knit material can fix. but above all, i am in loooove with this dress! it looks exactly as i had hoped, it’s comfy, i can dress it up or down and it’s super comfy! did i mention the comfort factor? 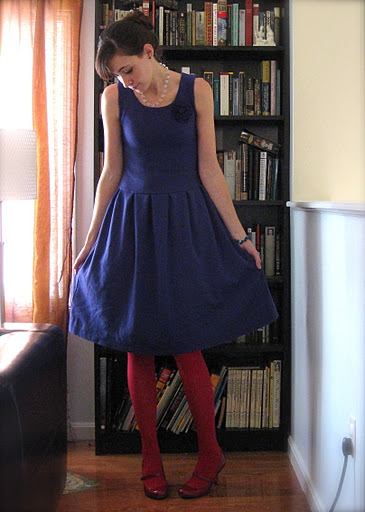 not sold on the silver colored tights… how about red tights with grey shoes? 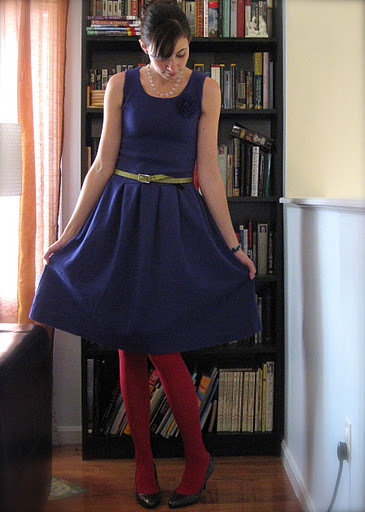 or red tights with red shoes? too much? oh yeah, and it didn’t cost me $150. and mine has a cute flower. so, i win. that’s how it works, right? so i needed (and i use the word “need” loosely here…) some sort of holiday… something. like a dress. i like to get inspiration perusing websites whose clothes are um… out of my budget at the moment (or ever unless our lives change dramatically). one of my favorites is of course, anthropology. sigh… pretty things… also, since i recently acquired a serger i’ve been dying to do something in knit. i came across this dress and thought it would be perfect to replicate for inspiration! it has a fitted bodice and pleated skirt (i love pleats!!!) and being knit, it’s very “toting-the-kids-around” friendly. 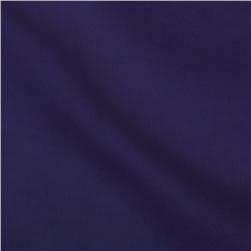 i went with a midweight cotton interlock knit in purple. i do love the texture the anthropology dress has but i couldn’t find anything similar i thought would work. i bought 2 yards of material and immediately learned lesson #1 in knitwear: buy more yardage than you think you’ll need! when they say buy extra to account for shrinkage it is not a joke. i lost over 10″ in length so it was a squeeze! fortunately the wide width of the fabric saved my behind. i had wanted to add elbow length sleeves but that idea was immediately scrapped. ooohh… it’s even organic. just doin’ my part. being my first knit anything naturally i skipped the pattern buying step and just traced off a t-shirt from closet. i know it was risky, but knits are forgiving, right? 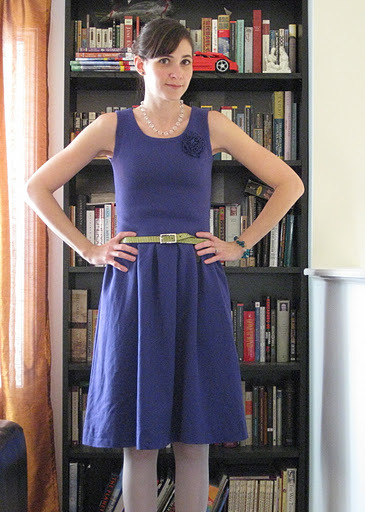 and i have a skirt pattern from a dress that worked for the bottom half. i had planned to line the dress with a stretchy tricot lining material. but apparently i got a tricot that doesn’t stretch? i was bummed about this, thus imparting lesson #2 in knitwear: do more research to figure out appropriate lining materials! (or maybe don’t rely on the online fabric store’s description). since my original lining didn’t pan out i decided to self-line the bodice. and in retrospect this worked out really well. had this been in my original plan, i could (and would) have used a lighter weight knit. but, since it is fall/winter the extra warmth will definitely be welcome! oh, and on the tuesday before thanksgiving i decided that i absolutely needed to have it done to wear on thanksgiving. after all, why make a dress for the holidays and then miss out on the first holiday of the season? with dinner guests coming no less!! someday i’ll learn to take my time and enjoy the process. and by show off i’m talking croissants. 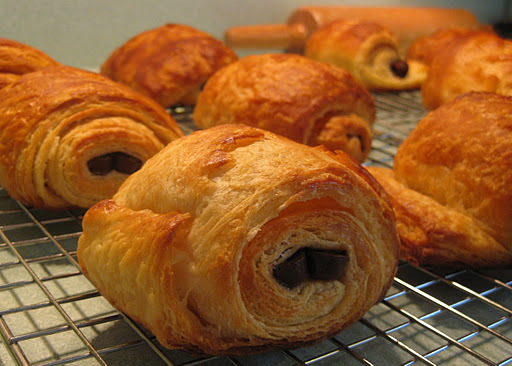 more specifically, pain au chocolat. ah, we must credit the french for making food sound so dreamy. i’ll preface this recipe by saying croissants require butter. loooots of butter and for that they make no apologies. but, when you put so much effort into making something, surely you’ve earned it. also, i’m hardly advising that you actually make these. i do like to be considered the awesome baker amongst my friends. 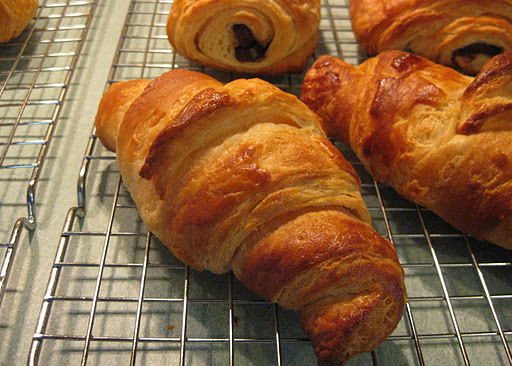 and if word gets out that croissants really can be made by anyone… well my awesome baker status might falter a bit. so… you should probably just watch, okay? begin with the dough. mix the flour, yeast, sugar and salt together in your stand mixer. add the milk and mix on low speed, increasing to medium. once the flour and milk is mostly incorporated, add the butter one piece at a time. knead the dough by machine until it is smooth. the dough should be slightly sticky. 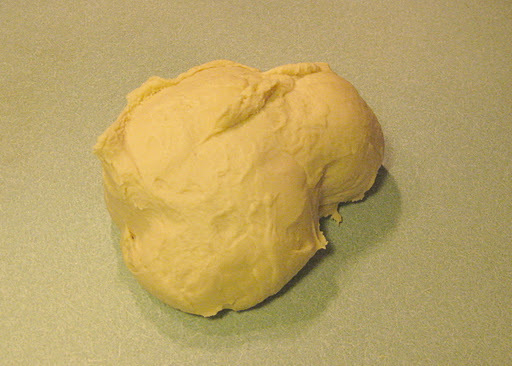 turn the dough out onto the counter top and form it into a ball. wrap with plastic wrap and refrigerate for 1 hour. time to make the butter square. 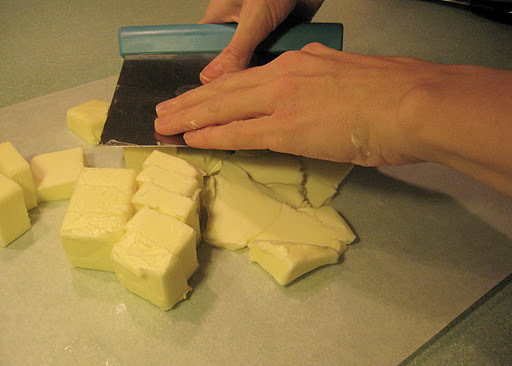 begin with your chilled butter, cut into 24 pieces. mash the butter with a metal scraper. when you get tired of doing that just go in with your hands to finish it off. 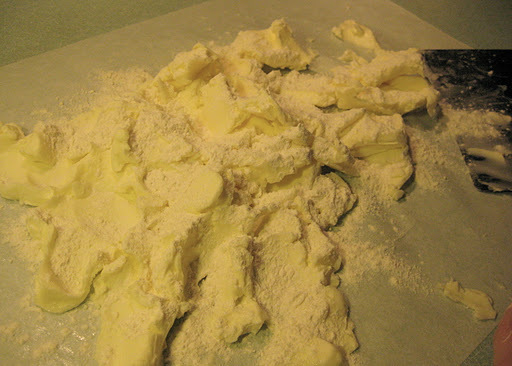 dust the butter with flour and continue mashing until it is all incorporated. form the butter into a 7″ x 7″ square and wrap it in plastic wrap or parchment and stash it in the fridge for at least 30 minutes. 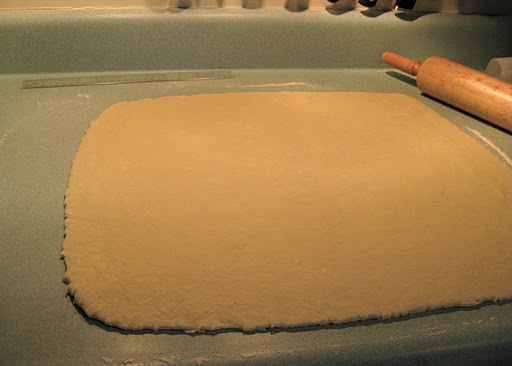 after the dough has refrigerated for 1 hour, roll it out on a lightly floured counter until it is an 11″ x 11″ square. yes, the measurements matter. 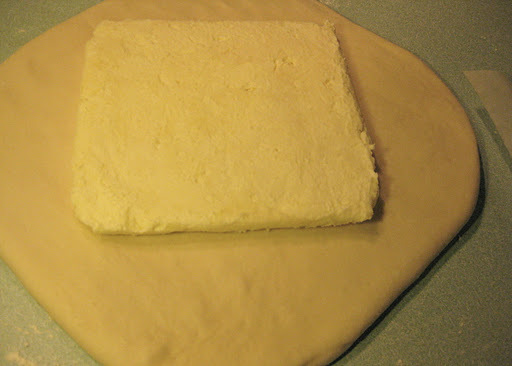 once you have done this pull out your butter square and and place it on the dough as seen below. pull up the corners and firmly pinch the dough together. make sure it is securely sealed then begin rolling it out. 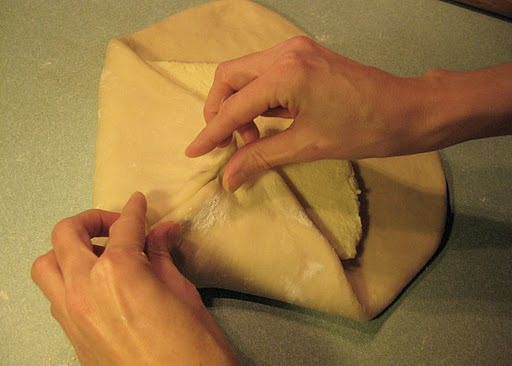 take your rolling pin and tap the dough from the middle out to the edges. this will get the butter to soften so you can roll it out evenly. 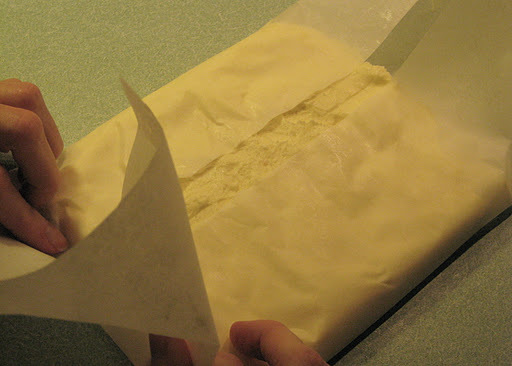 the key here is to keep an even layer of butter within the dough being careful not to break through the butter. 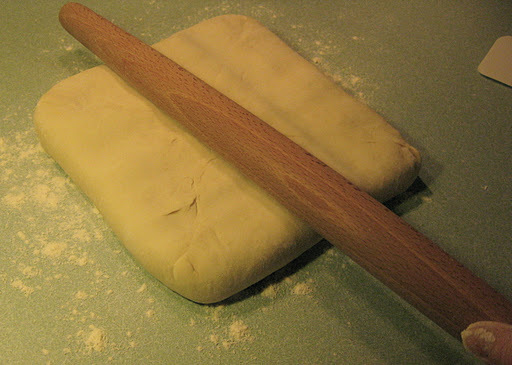 once the butter has softened slightly begin rolling the dough into a square 14″ x 14″. check the dough often to make sure it isn’t sticking to the counter. then in thirds again for the second turn. immediately wrap it in plastic and stash in the fridge for 2 hours. 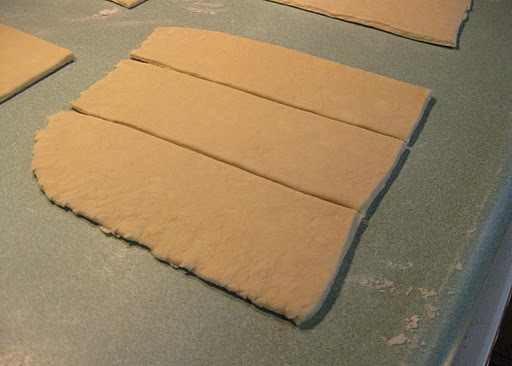 after 2 hours roll out the dough again to 14″ x 14″ and repeat the turns as before, for a total of 4 turns. wrap it and refrigerate it for at least 2 hours. since i like my croissants in the morning and not as a nighttime snack, i leave it overnight and finish it off the next day. 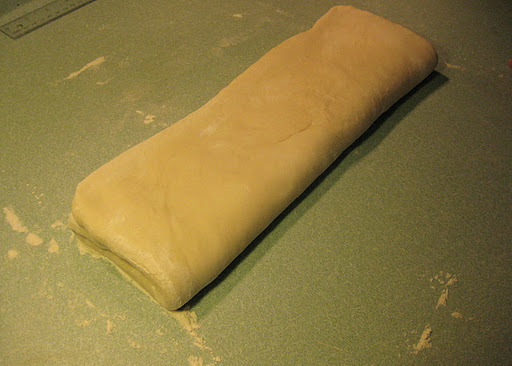 once the dough is properly chilled dust your counter top and gently roll the dough out to a 20″x 20″ square. an overnight chill does have the disadvantage of having extra time for gluten development making the dough a little harder to roll out. 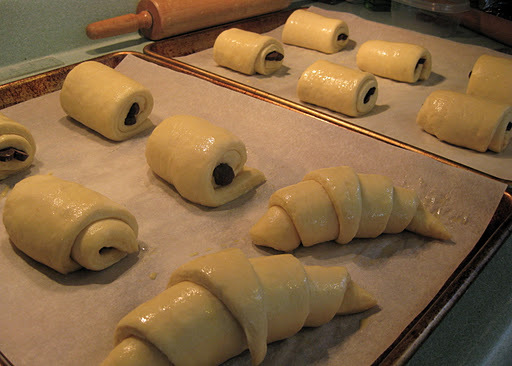 it’s okay to start rolling then walk away for a few minutes to let the dough relax. do make sure the dough stays cold. 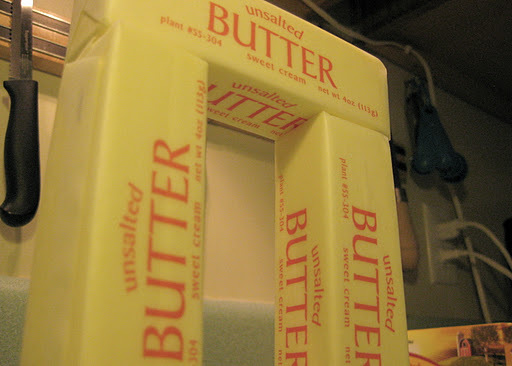 any melting of the butter and the whole thing might as well go in the trash. not kidding. if you feel the dough is getting too warm cover it and throw it back in the fridge for 15 minutes. so once you have your square, use a pizza cutter to divide it into fourths, then cut each into thirds so you have 12 pieces total. now for the chocolate! this is where the sticks of chocolate come in handy. 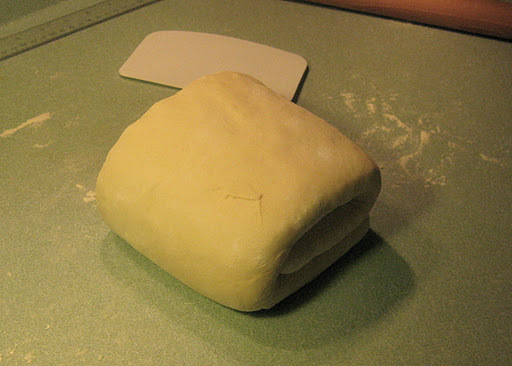 lay one or two toward one end of the piece of dough and roll it up. if you don’t have the sticks, just use about 1 heaping tablespoon of chopped chocolate and carefully roll it up. 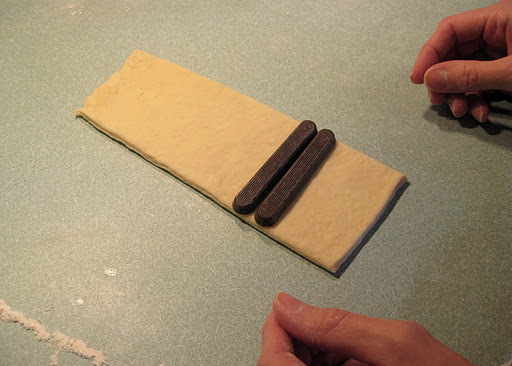 place the rolled dough onto two parchment lined baking sheets seam side down. cover loosely with plastic wrap and let them rise at room temperature until puffy, 45-60 minutes. yes, there are two regular croissants… i’ll explain in a bit. in the meantime, heat the oven to 400 degrees adjusting the racks to the upper and lower middle positions. when the dough is done rising, use a pastry brush and brush them with the egg wash.
bake for 20-22 minutes or until they are a nice deep golden brown, rotating the baking sheets from top to bottom halfway through. cool the croissants on a baking rack for at least 20 minutes. serve warm or at room temperature. 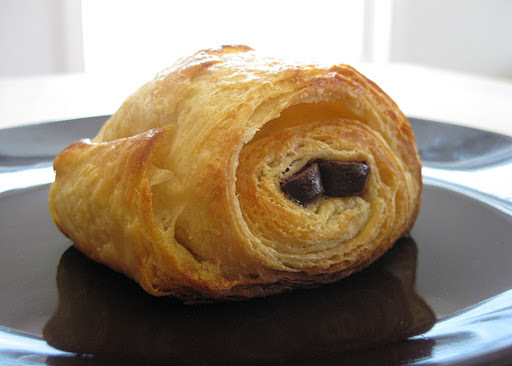 now, let’s say perhaps you ate a few of the chocolate sticks before making the croissants and perhaps you were two croissants worth of chocolate short… no worries, just form them into a traditional croissant shape. i took that fourth quadrant of dough and cut off one third then made a diagonal cut to form the last two thirds into triangle shapes. 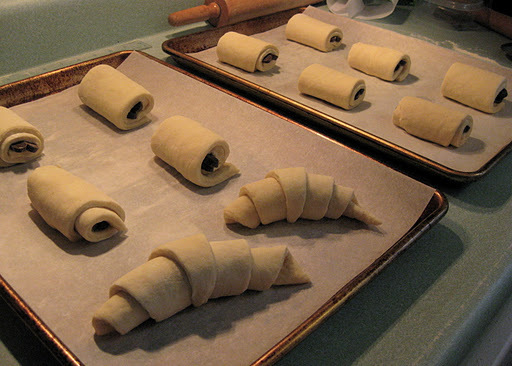 then starting at the wide end, roll it up and let it join the others for the final rise and baking. 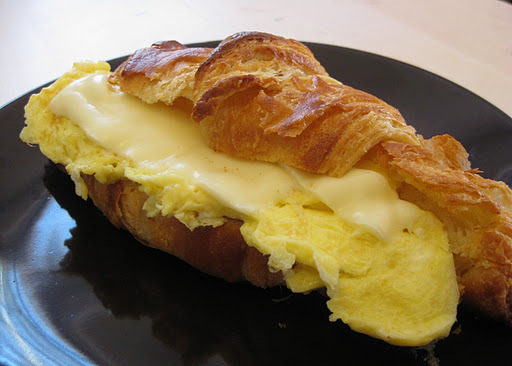 so, what to do with the odd regular croissant? make an egg sandwich, of course. with cheese. yup, that’s american cheese on there and i am not ashamed. i’m only sad i didn’t have any bacon or sausage to add. pain au chocolate— delish? yes. impressive? yes. difficult? NO! yes, very. so, don’t run off and try to make these, you just may end up with amazing praise-worthy pastries something awful and disappointing. *photos mostly by my awesome lil’ sis, monica who happened to be in town for a visit.